Thread 10 + 1.05mm hook: 1.75” (4.5 cm) long; 2” (5 cm) wide. Sport Yarn + 3.75mm hook: 3.5” (9 cm) long; 4” (10 cm) wide. 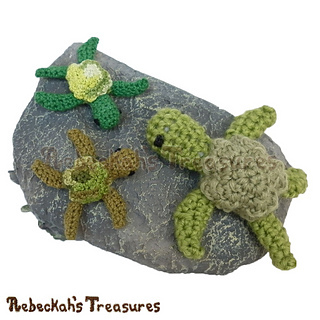 Looking for cute, miniature friends to crochet? 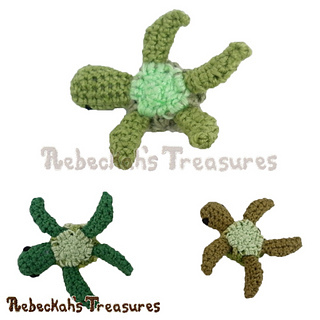 Try this adorable Mini Amigurumi Turtle Friend pattern. It’s perfect for all ages, it works great for last-minute or bulk gifting events, and it will make you and your dearest friends smile! 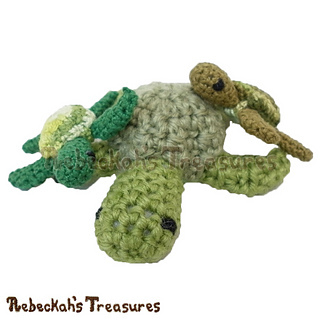 This minutes-to-make pattern includes written instructions and an 18-photo tutorial for crocheting this miniature turtle in multiple yarn weights. Gifting ideas include stocking stuffers for Christmas, trick-or-treats for Halloween and Birthday party favours! This crochet pattern is my contributor post for Underground Crafter. Go directly to the free pattern here, or learn more via my blog here. Coming Mid-November, 2016: It will also be available as part of an 8-page, printer friendly PDF eBook - digital download - ONLY $3.75. 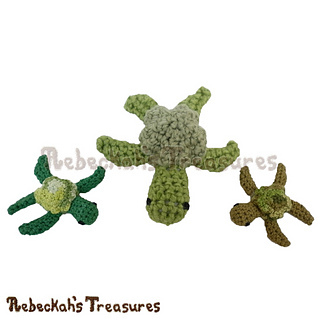 This eBook includes ALL three Mini Turtle Friends - Pencil Topper Turtle Friend, Mini Amigurumi Turtle Friend (this design) and Finger Puppet Turtle Friend (coming soon)! Thread 10 + 1.05mm hook: 1.75” (4.5 cm) long; 2” (5 cm) wide. Sport Yarn + 3.75mm hook: 3.5” (9 cm) long; 4” (10 cm) wide.